Pumas studied in the Santa Cruz mountains ignored the sounds of frogs but fled at the sound of human voices. Video courtesy of the Santa Cruz Puma Project. New research shows that mountain lions don't like encounters with humans any more than we do. Photo by Sebastian Kennerknecht/pumapix.com. 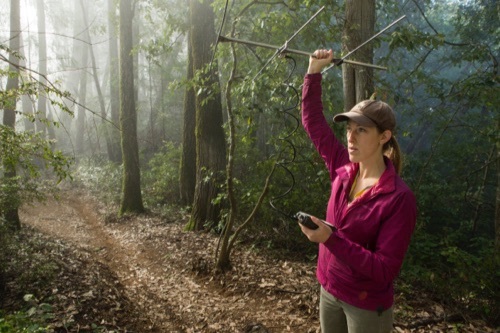 Puma researcher Justine Smith used telemetry gear to track pumas in the Santa Cruz Mountains. Photo by Sebastian Kennerknecht/pumapix.com. "Fraidy cat" isn't the way most people think of mountain lions, but when it comes to encounters with humans, perhaps they should. New research into the behavior of these big cats indicates that they don't like encountering humans any more than we like bumping into them on hiking trails. The findings are particularly valuable as human development encroaches on lion habitat and drives up the number of human-puma encounters. 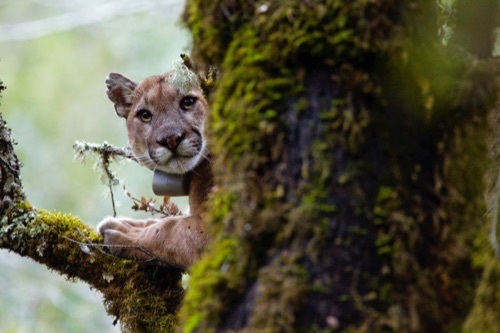 "We exposed pumas in the Santa Cruz mountains to the sound of human voices to see if they would react with fear and flee, and the results were striking: They were definitely afraid of humans," said Justine Smith, lead author of the paper "Fear of the human 'super predator' reduces feeding time in large carnivores," published in the June 21 online edition of the Proceedings of the Royal Society B.
Smith, who led the study as a graduate student in environmental studies at UC Santa Cruz, and her colleagues devised a novel experiment to gauge puma behavior: Her team placed audio equipment at puma kill sites in the Santa Cruz Mountains; when a puma came to feed, its movements triggered motion-activated technology that broadcast recordings of people talking, and a hidden camera captured the puma's responses. They broadcast recordings of Pacific tree frog vocalizations as a control. "We found that pumas almost always ran from the sound of humans—and almost never ran from the sound of frogs," said Smith, now a postdoctoral researcher at UC Berkeley. In 29 experiments involving 17 pumas, the pumas fled in 83 percent of cases as soon as it heard human voices, and only once upon hearing frogs. In addition to establishing the fear response, the study reveals changes in puma feeding behavior that could have implications for their well-being in human-dominated landscapes—and their impact on prey populations, particularly deer. The results build on previous work showing higher kill rates and lower feeding times in more human-populated areas. "We found that pumas took longer to return to their kills after hearing people, and subsequently reduced their feeding on kills by about half," said Smith. "Those behavioral changes are significant, as our previous work has shown that they cause pumas to increase their kill rates by 36 percent in areas with high human activity." This is the first study to experimentally link the fear of humans to feeding behavior in large carnivores, said Chris Wilmers, associate professor of environmental studies at UC Santa Cruz and a senior author on the study. "Fear is the mechanism behind an ecological cascade that goes from humans to pumas to increased puma predation on deer," said Wilmers, a wildlife ecologist who studies the cascading effects large carnivores can have on their prey. "We're seeing that human disturbance—beyond hunting—may alter the ecological role of large carnivores. As we encroach on lion habitat, our presence will likely affect the link between top predators and their prey." The experiment was part of a long-term study of puma ecology in the Santa Cruz Mountains that began in 2008. All 17 pumas in this study have housing developments in their home range, and exposure to humans is commonplace. Kill sites were identified with data transmitted from GPS-monitoring collars worn by pumas that have been captured, collared, and released as part of the project. Human voice recordings were broadcast to mimic the natural volume of human conversation. In addition to Smith and Wilmers, coauthors include Justin Suraci and Ayana Crawford at UC Santa Cruz, and Michael Clinchy, Devin Roberts, and Liana Zanette at Western University in Canada.